The countdown to an unpredictable exploit of live art, poetry and dance—all at the unabashed hand of chance—starts now. Slated to be Norte Maar’s most daring collaborative event yet, The Brooklyn Performance Combine will take place this Saturday, November 1st from 7-9pm at The Brooklyn Museum. This signature combine event is up against the current Crossing Brooklyn: Bushwick, Bed-Stuy and Beyond exhibition, which has surveyed (and so declared) "the 35 hottest artists from Brooklyn"—but get ready for a dark horse—or trojan horse if you will. These artists will all be performing together for the first time, bringing with them the most daring of sights, sounds and moves, pushing through The Brooklyn Museum's typical boundaries. Centotto’s Paul D’Agostino will be among the featured poets and writers, alongside sculptors Ben Godward and Jim Osman, whos' intended creations are rumored to be nothing shy of risky and off-the-ground. The shuttering beat of glass tap shoes might attract or distract from the soundscapes of cellos and violins, perhaps competing for reverberating sounds above the dancers' leaps and bounds. Producer Jason Andrew didn't hesitate to put together a daring group of artists and performers: known for his critical work, artist Loren Munk's loaded painting will hint with the lines of "as many artists as I can fit in this canvas that the Brooklyn Museum has ignored." Jason tells us this will be a larger "statement of making painting performative," with some other surprises which we cannot tell ahead of the event. 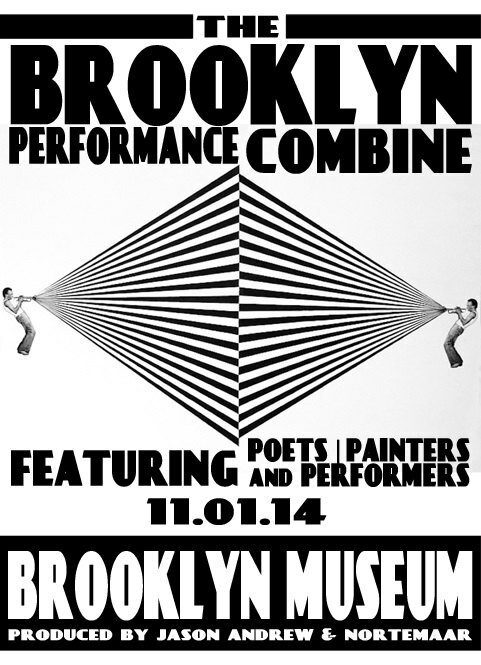 The Brooklyn Performance Combine will take place November 1st from 7-9 pm inside the 2nd floor Beaux-Arts Court of at the Brooklyn Museum at 200 Eastern Parkway. The event is free as part of the museum’s Target Free Saturday.